It's been over two years since the Harvard men's basketball team has earned a spot in either the AP or Coaches Poll. The Crimson nabbed the final spot, tied with Utah, in the AP Poll on Friday. The awards keep pouring in for Harvard men's basketball coach Tommy Amaker. Last week, Amaker was named the National Association of Basketball Coaches (NABC) Coach of the Year for District 13, which composes New England. That distinction came just days after he was tabbed as the United States Basketball Writers Association of America (USBWA) District I Coach of the Year. Amaker is also a nominee for two prestigious coaching awards that will be announced this weekend. He is one of 21 finalists for the Ben Jobe Award, given annually to the top minority coach in Division I men’s basketball and is also one of 21 finalists for the Hugh Durham Award, presented each year to the top mid-major coach in Division I. Both honors will be announced Friday at the CollegeInsider.com awards banquet in New Orleans, La. on the eve of the Final Four. Amaker insisted this week that the honors were a reflection of the job done by those around him. 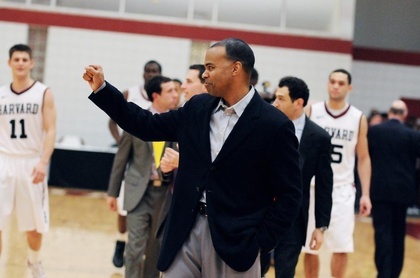 After leading Harvard to a 26-5 record, an appearance in the Top 25, and its first NCAA tournament berth in 66 years this season, Amaker’s name has again been linked to major-conference jobs, just as it was last year. But the award-laden coach again insisted this week that he had no plans to leave Lavietes Pavilion anytime soon.